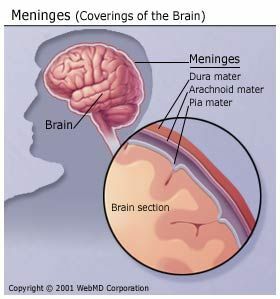 Meningitis is a relatively rare infection that affects the delicate membranes -- called meninges (men-in'-jeez) -- that cover the brain and spinal cord. Bacterial meningitis can be deadly and contagious among people in close contact. Viral meningitis tends to be less severe and most people recover completely without specific therapy. Fungal meningitis is a rare form of meningitis and generally occurs only in people with weakened immune systems. Meningitis is almost always caused by a bacterial or viral infection that began elsewhere in the body, such as in the ears, sinuses, or upper respiratory tract. Less common causes of meningitis include fungal infection, autoimmune disorders, and medications. Bacterial meningitis is an extremely serious illness that requires immediate medical care. If not treated quickly, it can lead to death within hours -- or lead to permanent damage to the brain and other parts of the body. Bacterial meningitis is caused by any one of several bacteria. The most common bacteria causing meningitis in children and adults in the U.S. are Neisseria meningitidis ("meningococcus"), Streptococcuspneumoniae("pneumococcus") and, in older patients with decreased immunity,Listeria monocytogenes. Haemophilus influenzae type b (Hib) was a common cause of meningitis in infants and young children until the Hib vaccine was introduced for infants. Vaccines are available for bothNeisseria meningitidis and Streptococcus pneumoniae. They're recommended for all children and adults at special risk. The bacteria can spread from person to person through coughing andsneezing. If you are around someone who has bacterial meningitis, contact your health care provider to ask what steps you need to take to avoid infection. In many instances, bacterial meningitis develops when bacteria get into the bloodstream from the sinuses, ears, or other part of the upper respiratory tract. The bacteria then travel through the bloodstream to the brain. Viral meningitis is more common than the bacterial form and generally -- but not always -- less serious. It can be triggered by a number of viruses, including several that can cause diarrhea. Fungal meningitis is much less common than the other two infectious forms. Fungus-related meningitis is rare in healthy people. However, someone who has an impaired immune system -- such as a person with AIDS -- is more likely to become infected with this form of meningitis. Who Is Most at Risk for Meningitis? Studies have shown that meningitis is more of a danger for people with certain medical conditions, such as a damaged or absent spleen, chronic disease, or immune system disorders. Because certain germs that cause meningitis can be contagious, outbreaks are most likely to occur in places where people are living in close quarters. So college students in dorms or army recruits in barracks are at higher risk. So are people traveling to areas where meningitis is more common, such as parts of Africa. However, keep this in mind. Even if your personal odds of getting meningitis are higher than average, it's still a rare disease and there are steps you can take to minimize your risk of getting the disease. Most people with viral meningitisusually start getting better within 3 days of feeling sick, and they recover within 2 weeks. With mild cases of viral meningitis, you may only need home treatment, including drinking extra fluids and taking medicine for pain and fever.